I SPENT TWO AMAZING DAYS at Hunting Island, S. C., in a beachside cabin where Dr. Martin Luther King Jr. visited five decades ago. A nearby retreat and strategic planning center, Penn Center, drew King Jr. to the area. It was at the Penn Center that members of the Southern Christian Leadership Conference gathered to plan for change. During the 1960s, the cabin was owned by the Siceloff family, and according to a sister of the current owner, it was a safe place for blacks and whites to meet at that time. Elizabeth and Courtney Siceloff worked with the Fellowship of Southern Churchmen and were assigned to Penn Center from 1950-1969. It was during this time that they built the cabin that now belongs to Constance Curry, a writer, activist and fellow at the Institute for Women's Studies at Emory University in Atlanta. 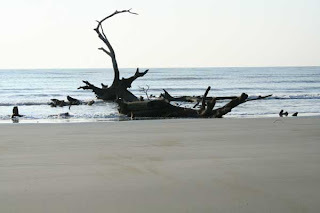 As if its fascinating history isn't enough, Hunting Island is undergoing erosion problems and the southern portion of the state-owned cabin road has been washed away. On July 14, a resolution was passed by the Beaufort County Safety Committee for the evacuation of the remaining 10 cabins due to the peril of the ocean. The road will not be repaired and therefore the cabins cannot be reached by emergency vehicles or personnel. While I had a beautiful time and a perfect pre-semester adventure, I am saddened by this inevitable end of an era.